good bike. and nice to look at the happy owner. Om! from the right, up in the air, side stand a wobblin. looks like a recipe for disaster. That is a badass build bro, love the paint and pipes! nice looking bike! sweet paint and whacko (in a very cool way!) exhaust! recommend you get some leather boots! Whitewall has to go. Makes your great build cluttered. Everyone??!!??!? I didn’t sign on for that. I just havn’t seen “Everyone” yet and thought I would use it. Sorry it had to be on your excelent build. I like that you pulled together a lot of different styles/eras and molded them into one bike. Just tired of seeing items used on a build because someone thinks they have to: whitewalls, sporty tank, springer seat not on a hardtail, brass, trailer fenders, and most of all deleating YAMAHA from the side cases. I understand that everyone has a different style, but the above list has been overplayed and/or is just bad taste. 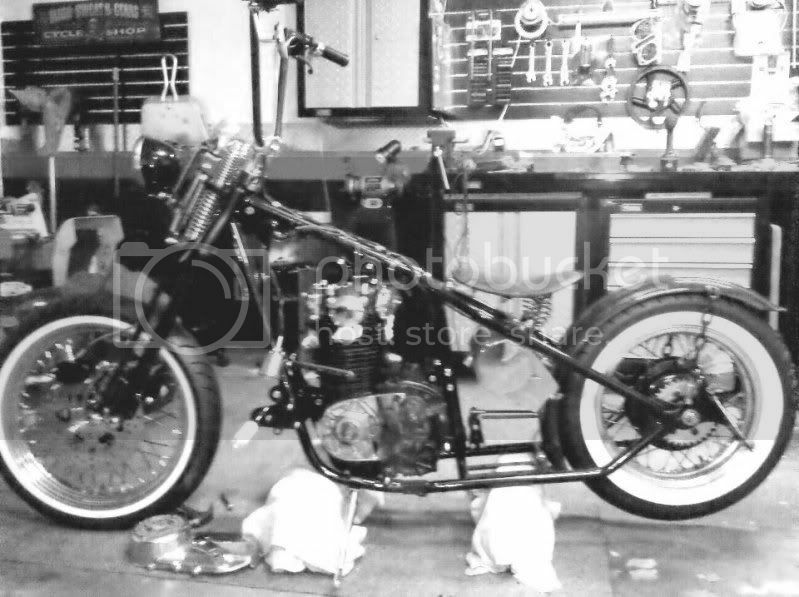 Back to your bike; lets see some pics of this fine build. And to everyone looking, follow Dannys lead, build something outside the cookie cutter mold and make it look good. Its a better startup when its a hot day and the driver is wearing a filled up bikini!